Above, people carry drinking water in Bangladesh. 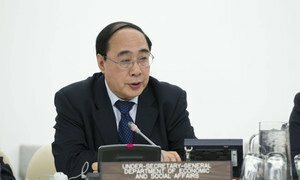 Thirteen years after the world set the Millennium Development Goals (MDGs), countries have made big strides to meet the eight anti-poverty targets by their 2015 deadline, says a United Nations report released today, which stresses that the unmet goals are still within reach, but nations need to step up their efforts to achieve them. “In more than a decade of experience in working towards the MDGs, we have learned that focused global development efforts can make a difference,” Secretary-General Ban Ki-moon says in the report's foreword, in which he urges for accelerated action to close development gaps. Agreed upon by world leaders at a UN summit in 2000, the MDGs set specific targets on poverty alleviation, education, gender equality, child and maternal health, environmental stability, HIV/AIDS and malaria reduction, and a global partnership for development. The Millennium Development Goals Report 2013 shows how the combined actions of governments, civil society and the private sector have made substantial progress in meeting many of the targets, while also pointing out which areas are falling behind and require immediate attention. Countries have also made great strides on health targets, and are within close reach of achieving them by 2015. These include reducing the mortality rates from malaria and tuberculosis and stopping HIV infections. The report notes that progress has been uneven among regions, as well as between population groups within countries, with people living in rural areas finding themselves at a disadvantage. Between 2000 and 2010, mortality rates from malaria fell by over 25 per cent, averting some 1.1 million deaths, and between 1995 and 2011, a total of 51 million tuberculosis patients were treated, saving 20 million lives. Regarding HIV, the report notes that new infections are declining and 8 million out of the 34 million infected people are now receiving antiretroviral therapy, making universal access to treatment reachable if trends continue. Other areas where progress has been significant include the reduction of people suffering from undernourishment and the decline of the proportion of slum dwellers in cities. Between 2000 and 2010, over 200 million slum dwellers gained access to improved water sources, sanitation facilities, durable housing or sufficient living space, exceeding the 100 million MDG target. However, countries are falling short on other targets including those regarding maternal health, providing universal access to education, expanding access to sanitation, and achieving gender parity. In particular, the goal pertaining environmental sustainability is under “severe threat” as growth of global emissions of carbon dioxide (CO2) continues to accelerate, with emission today being more than 46 per cent higher than in 1990. “Forests continue to be lost at an alarming rate. Overexploitation of marine fish stocks is resulting in diminished yields […] birds, mammals and other species are heading for extinction at an ever faster rate, with declines in both populations and distribution,” the report warns. Progress has been uneven, and the report points to disparities among regions and between population groups within countries, with people living in rural areas finding themselves at a disadvantage. The report also states that the global economic crisis has left millions unemployed, and has reduced the amount of development aid for those countries that are most in need. In spite of these developments, the report urges sustained momentum, noting that countries will have to build on MDG achievements when they decide on a post-2015 agenda. A global partnership for development is critical to underpin the post-2015 development agenda, a senior United Nations official today said at an international forum in Ethiopia to discuss poverty eradication and sustainable development after the Millennium Development Goals (MDGs).